Suspect claims knife not intended for terror attack and is released. A terrorist released within the context of the 2011 "Shalit deal" was arrested last night by police after a knife was found on his person near the Binyamin community of Adam, 0404 reported. The Shalit deal saw the release of over 1,000 terrorists, 280 of whom were serving life sentences for terrorism, from Israeli prisons in exchange for the release of soldier Gilad Shalit, who had been kidnapped by Hamas terrorists in 2006. Many of the terrorists released in the deal were later rearrested for continuing after their release to carry out terror attacks, including those in which Israelis were murdered. According to the report, the terrorist asserted during his interrogation that the knife he was carrying was a new knife that he had obtained for private use, not for an attack. Police told 0404 that the suspect was released following his interrogation. 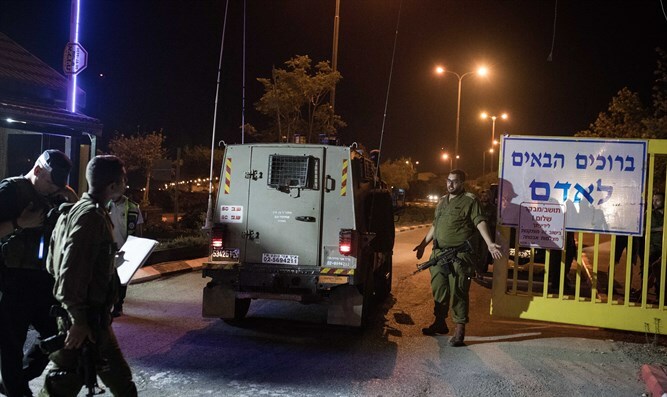 Last month, 31-year-old Adam resident Yotam Ovadia was murdered by a 17-year-old terrorist stabber from the PA-controlled town of Kobar who hopped the security fence of the town. Two others were wounded by the terrorist, of whom one responded by firing at the terrorist, killing him.